So, I got my ipad for the California trip. One of the hardest thing about adding a new electronic device is suddenly having to figure out all those passwords you have Google remember for you. I decided setting up the ipad was a very good reason to change passwords I've used for years. Even if they are alpha-numeric, someone could, given enough time, crack them, so I needed to update. I'm not that paranoid, mind you, but we'll use the word "prudent". Yes, that's a good word. I have a Yahoo account. After I'd found my way onto the Internet with AOL, I quickly moved to ATT/Yahoo when upgrading my phone and Internet. It works adequate and has become my web address of choice for online shopping. But it seemed to need an act of some god and probably a sacrifice of a large number of small animals to get the password changed. The other issue is that I access personal accounts during lunch at work, so there is my work computer which has access to all my passwords. Add a cell phone and it can be a headache and a half to change passwords, even when it's a good idea. No wonder people don't want to. Once that was done, and I was only able to get the guild's Twitter account up and running (yes, my WoW guild has quite the social media presence) once I was in California, but everything worked on the ipad exactly as I wanted it to. (Passwords don't work if you write them down wrong, just an fyi there.) I took a large card and wrote all my important passwords on it. I keep it, usually, with the ipad. The card doesn't have my name on it so, even if someone were to steal the ipad, actually getting into the thing (which is password protected) and then finding one's way around, would be more hassle than it's worth. When not in use, I keep the ipad turned off and the card's by my computer. I recently cleaned all the cookies off my main system and had to type in all the passwords for frequently used sites. I have a planner, with all my passwords for places I've gone written in it, but it's a hodge podge of web sites and is on the list of things to clean up in an effort to find my Dunkin' Donuts password when I need to recharge my card; you know, important stuff. 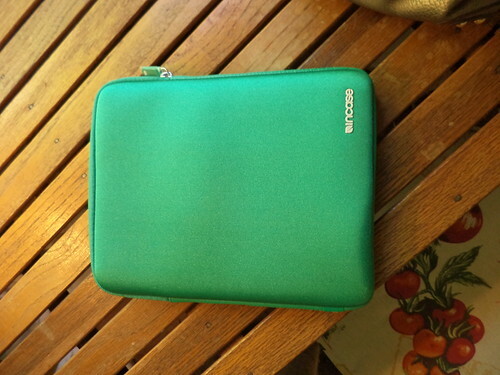 Anyway, I got a hard back for the ipad, to protect it, but what I really needed was a case. If I just stick it in my carry-on, it could get scratched. Looking about, I found the following case from Incase. I don't see this version on their web site anymore, unfortunately. It came in a variety of colors and I toyed between a royal blue and this color. 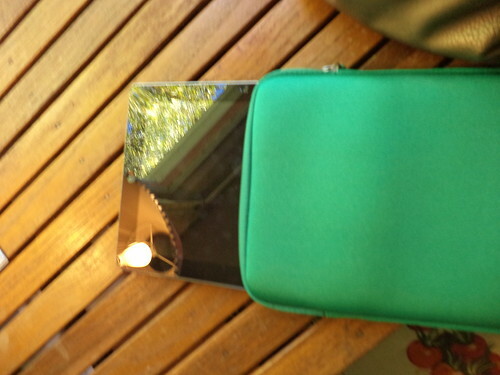 My ipad fits snugly inside. There's a layer of foam that goes over the screen and a small silica packet at the bottom of the case to absorb any moisture which might get in. The plastic zipper is crisp and I don't have a problem zipping or unzipping the case. It works wonderfully well and I keep the ipad in it when I'm not using it. 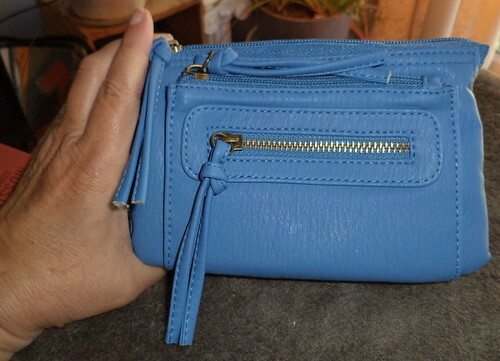 Another item I purchased was this purse, well, clutch, by definition. The issue for me was I didn't want to be hauling my purse around BlizzCon. The purse is two and a half times the size of this and while it could stow pretty much anything I might want to carry, did I really WANT all that stuff with me? The reality was I wanted something about hand size which wouldn't get in the way. I got it from Target and they still have a few in the price I paid. I had a difficult time deciding on color. Black goes with everything and the purple was kind of cool, but blue won in the end. There are so many pockets in this thing. I can sort business into one pocket; receipts and bills and credit cards into another, and change into a third. 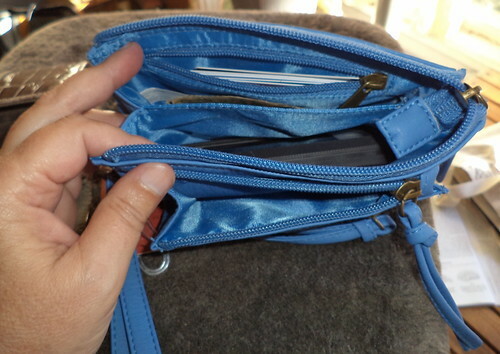 In the main part of the clutch, there are two sections, which are big enough for my camera and my cell phone. I had to clean out the purse and decide what, exactly, needed to go with me; what was essential. The wrist strap is sturdy and the whole thing is just a bit over the size of my hand. All the time at BlizzCon and Disneyland, I could carry my life with me and know it was safe. It fits in the glove box or center well of the Jeep or under the seat, safely stowed from anyone looking inside. My original purpose was to use this just for the vacation but I like it so much, it's my purse now. It fits neatly in the top drawer of my desk, now that the junk which was in there has been removed. I've whittled my carrying to just what I need and I'm finding I'm really okay with this. 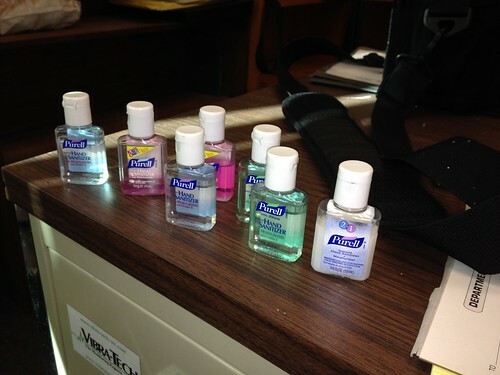 Lastly, Liz mentioned in an email, we should do what we can to protect ourselves from the onslaught of germs. At the time, I hadn't gotten my flu shot; there hadn't been time to schedule it. Her comment, "If you haven't gotten a flu shot, I recommend it. 25,000 people in reasonably close quarters to each other can pass the crud very fast." Oh that's right. I'll be around people; me, with the compromised immune system. I don't think I've ever picked up the phone faster to call my doctor. Liz also recommended hand sanitizer. I had some in the Jeep, but, over time, it seems to have dwindled to just a bit in the bottom of the container. Open the top left desk drawer and look what I have. I happened to have a "few". Took the whole mess with me. These bottles were the perfect size to tuck into my new clutch. I didn't wind up using them as much as I probably could have, but I didn't shake hands with people. I stood next to them. I didn't meet anyone, other than costumed characters, at Disneyland, and I assume Chip and Dale have had their shots.